Yellow Vest Anti-Government Protests In France Turn Violent Violence broke out Saturday as yellow vest protesters kept the pressure on French President Emmanuel Macron's government, for the 13th straight weekend of demonstrations. 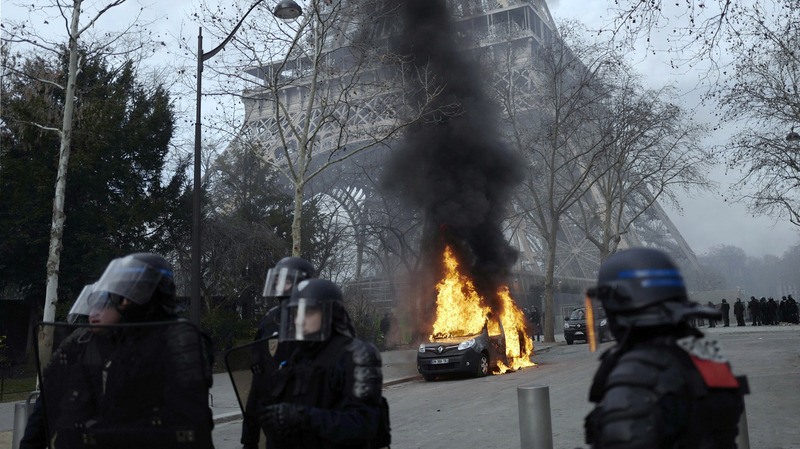 A burning command car belonging to France's anti-terror squad is pictured as riot police take position near the Eiffel Tower. The man's hand was nearly blown off when he picked up a tear gas grenade and it exploded, according to NPR's Eleanor Beardsley. "This is the second severe injury in as many weeks and will likely inflame tensions between the government and the yellow vest movement," Beardsley reported. "Even though the number of yellow vest protesters has diminished each week." Another protester recently suffered an eye injury from being hit by a rubber bullet. The yellow vest protests began in mid-November, spurred by anger over high gas prices in rural areas where people depend on their cars because of no access to public transportation. This weekend, demonstrators set fire to multiple trash cans and an anti-terror military car. France's interior Christophe Castaner tweeted his indignation over the car being set on fire saying,"These attacks are intolerable." Police said 31 protesters were arrested on Saturday but the AP reports France's Interior Ministry said this week's protest was significantly smaller than last week's. Representatives for the yellow vest movement dispute that claim, according to the BBC. The French government is holding a series of public debates in the hopes of placating the ongoing unrest. "What's being called the great national debate has so far been very popular with hundreds of thousands of French people, but many yellow-vesters have denounced it as a marketing ploy," Beardsley said. Macron is hoping the meetings, several of which he has personally attended, will help quell the crisis by giving citizens the opportunity to express their anger and frustration.